I hope you enjoyed the holidays and are happily and safely returned if you spent time on the road or in a plane. I had the pleasure of taking a few day off to spend with S, much of our time spent weaving potholders, drawing, tying friendship bracelets, painting, and sewing some very simple little drawstring bags that she was so excited to make and use. We also organized some closets and sorted a box of her artwork and schoolwork from 2011 so we could see how she’s developed and reminisce about the year. Have you taken a look back at your sewing in 2011, and are you starting to plan your sewing for the new year? Did you learn or accomplish something you’re especially proud of, and do you have goals for 2012? I’d love to hear from you. Such a lovely collection of projects. How proud you must be to play a role in making these projects possible. I have indeed taken a look back at 2011 on my blog: http://www.milkybeer.blogspot.com/2012/01/looking-back-at-2011.html It was such a great year for sewing in my life. I can’t wait for what’s ahead in 2012! I started seriously sewing clothing for my two children using the Oliver + s patterns back in April and since then, have found that the majority of what they wear are now handmade by me. It is such a satisfying conclusion to what has been a goal for 9 years. I am sure to continue of course. This year has started with the cutting out and sewing of 7 pairs of sketchbook shorts for my 6 year old son. I plan to use this pattern for his school shorts before the month is out. My goal this year is to sew more and somehow be more efficient in completing my projects. I want to also sew things for myself as this hasn’t happened for a very long time. My sewing is going to be used in service to the school community this year by sewing the costumes for our upcoming school production. There are about forty costumes to sew and so far it is only me doing it. This may take up the vast majority of my time for the first half but I see it as valuable in so many ways and I am very much looking forward to it. Kim, I can see you were busy in 2011! It’s fun to see what everyone made, and I love to see our patterns made up–it’s so exciting to see what people do with them. Tamara, you have some very admirable goals for 2012! I’d love to see some of those costumes. And I’ve been thinking about some tips for making sewing more efficient, so I’ll write a post about that soon. 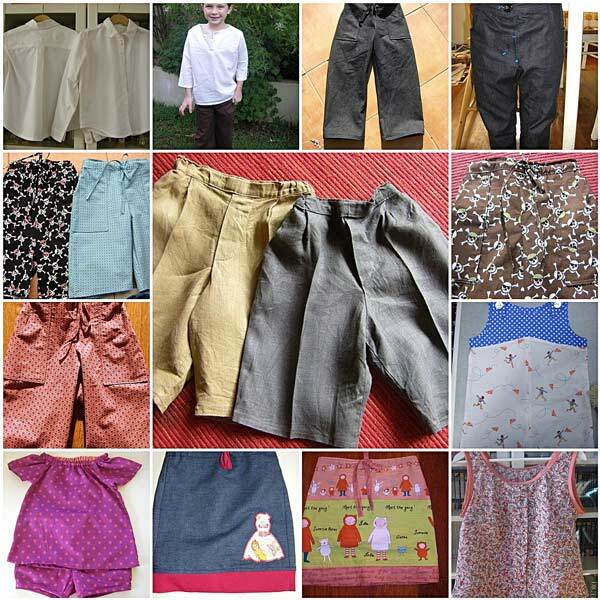 Thank you so much for including my sewing in this post Liesl – your patterns are what really hooked me into sewing. My goals for this year are to try not to procrastinate so much over what to make, and just to get some more sewing done! I’m really wanting to try and do more sewing for myself, as well as for the kids – fingers crossed! My sewing goals for 2012 are to (1) not be so deadline oriented and enjoy my project a lot more and (2) sew a lot more!!! Liesl, I’d love some tips on making sewing more efficient! And I know you’ve heard this already, but your patterns are the best! 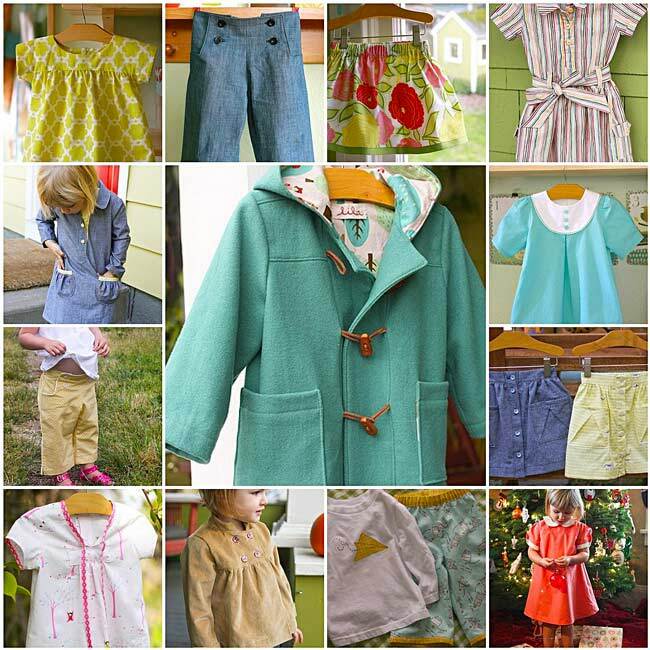 You enable a beginner to make garments that look like they’ve sewn for years! I feel like I learn so much from each of your patterns! Thank you! Happy New Year and Happy Sewing everyone!! Liesl, I have enjoyed watching your latest designs come to market. My favorite is still your first — City Weekend. I made the companion quilt for my son’s girlfriend Emily. She loved it and you can see her joy in the photo with Kyle the night I finished the last stitch. I am now making the Birthday Party dress for my cousin’s granddaughter. Your patterns are adorable. Thank you! 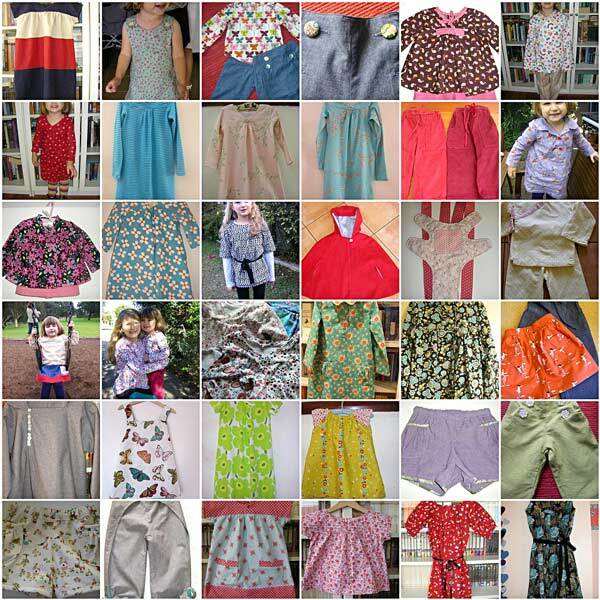 Thank you for sharing my “sewing year” photo in this photo! When I decided I was going to sew as much as I can for my daughter (before she gets old enough to pick her own brands/clothes), I wasn’t expecting to sew as much as I ended up doing (lack of time and lack of prior sewing training). But, discovering O+S patterns made it all possible. Besides being quite additive, O+S patterns are the only ones that get to use my precious Liberty fabric without a blink. Every single item I sew, it’s perfect! Every time, always! And, that’s about best marketing for a brand I can think of! 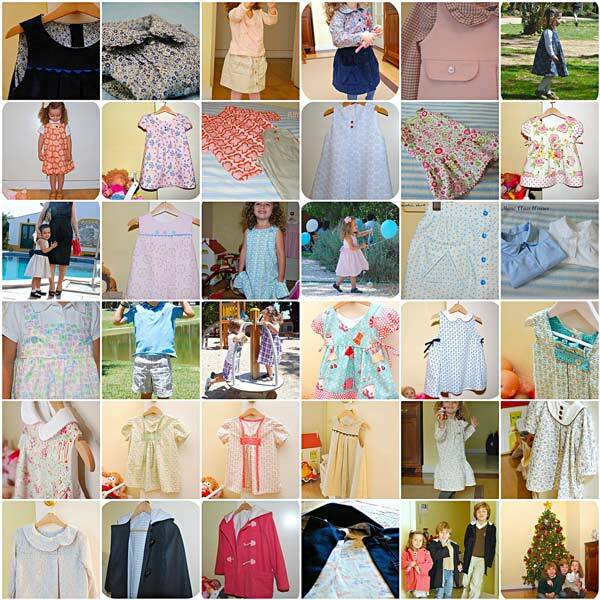 In 2012, I hope to continue expand my little’s girl handmade wardrobe and expand my projects to include more sewing for me (lisette, of course) and for my boys (which are always left behind – in the sewing dept – and love to wear handmade clothes).